If you are looking to raise finance we will look at all your finance options as well as remortgaging. Homes built from concrete tend to be cheaper than similar brick-built properties in the same area, and as a result may tempt buyers. However historically concrete houses have gathered a reputation of being difficult to get a mortgage on due to issues resulting from steel reinforcements in the building corroding and expanding which can cause the structure to degrade. However if the property has had the proper refurbishment to ensure these problems do not arise concrete house mortgages are becoming more easily available. When applying for a concrete house mortgage it is likely you will be asked to provide paperwork to confirm that suitable works have been carried out to prevent issues with the build arising. If the property you are interested in is known as a Pre-cast Reinforced Concrete (PRC) build you will in most cases be required to provide a PRC Competition Certificate to the lender which is a confirmation that a structural engineer has visited the property and confirmed that the required structural work has been carried out to make the building secure from the issues that have historically be associated with this type of property. This is because the lender essentially wants to ensure that the property will maintain its value and not fall into negative-equity due to degradation and that it will be relatively easy to sell on if the borrower fails to keep up with their repayments and they have to repossess the property, as this holds for them a higher risk losing the amount they originally loaned you. Due to the higher risk involved for the lender you may find that a mortgage offer for a non-traditionally built home may have higher interest payments than you would expect on a traditional home of a similar size in the same area, as well as being required to put down a larger deposit on the property. When looking into buying a non-traditionally built property remember that there are many different kinds of concrete property some of which have been judged as ‘defective’ and are particularly hard to mortgage while some concrete builds have been considered much more mortgageable than others, therefore gathering as much information as possible about the property before approaching a mortgage lender can help you to judge its suitability. 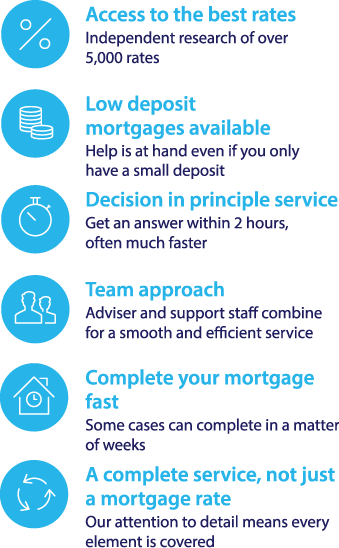 When looking into the purchase of a concrete house with a mortgage you may find speaking to an independent mortgage advisor who can research the whole market for options may really help you to find a mortgage suitable for your specific needs. If you’re thinking of purchasing a building of non-traditional construction and want to find out if mortgaging may be an option for you, or you just wish to learn more, you could fill in your details on the form on the side of this webpage, for a call back from a Fair Mortgages Advisor to be provided with a free initial conversation about different mortgages. You may also want to look at the mortgage calculator offered on this website. Call our mortgage team on 0117 313 7780 or complete our callback request form.